Or Tor Kor Market, Bangkok ตลาด อ.ต.ก. This may make me sound a bit extreme, but I’ll say it anyway: failure to include Or Tor Kor Market (ตลาด อ.ต.ก.) 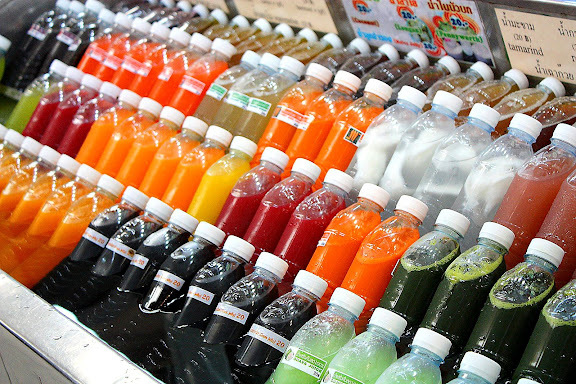 in your plan is nothing short of a cardinal sin if you’re a foodie visitor to Bangkok. It’s true. I can’t think of anywhere else where you can get this wide variety of local goodies in a clean and organized environment. Sure, you can visit a local market, such as Bang Kapi market (ตลาดบางกะปิ) or its ilk, but that involves jostling with people, motorbikes, tuk-tuks, and being forced off the sidewalks due to the overcrowding of street hawkers in some areas. If that’s your cup of tea, then please disregard my recommendation. But if you like to stroll leisurely up and down the aisles admiring and sampling beautiful and delicious foods with a roof over you and no motorbikes behind you, then Or Tor Kor is the place to be. The upscale market is organized by the Marketing Organization for Farmers (องค์การตลาดเพื่อเกษตรกร), whose initials in Thai อ.ต.ก. have led to the odd name Or Tor Kor* – the kind of romanization that stabs in the hearts of all linguists like a poisoned dagger. It boasts a vast array of prepared foods, fruits, vegetables, and all kinds of agricultural goods. Khanom Krok ขนมครก – Little “cakes” made of rice flour and coconut milk featuring thin, crunchy bottoms and sweet, creamy, gooey tops. Remove them from my life and there will be one fewer reason to live. The market has been around for, oh, I don’t know, a long time. When I was young, I often spent weekends at the house of one of my aunts who insisted on taking her kids, against their will, to Or Tor Kor market every Saturday. Of course, I got put in the car along with my cousins and we would sulk and whine all the way to the market and back. Noi Na (น้อยหน่า) or custard apples – one of the fruits I miss the most. Back then, a market — any market — was just a market. As a kid, I didn’t really get what the big deal was about Or Tor Kor market and why my aunt liked it so much she thought a trip there was worth schlepping a bunch of whiny, ungrateful kids across town with her. Fresh durian ทุเรียน – If you plan on taking the subway home, be informed that durian is not allowed on the train. Don’t think that you can sneak the sucker past the guard at the checkpoint; you won’t be able to. That was a long time before all the expressways were built and it took almost an hour by car from their house to the market. An hour-long ride to a zoo or an amusement park would have been tolerable; an hour-long drive to something as pointless as a market was downright torturous. But I remember how my cousins and I would promptly shut our whiny mouths once we got out of the car and started tailing after my aunt and uncle up and down the market aisles. We sampled this and that along the way, and everything was so delicious. The best part was the meat, or whatever it was, on sticks. No sane kids I know can ever say no to stuff on sticks. I can’t speak for my cousins, but for me, it didn’t take long for Or Tor Kor market to start growing on me. I went from dreading a trip to the market to really looking forward to spending a weekend at my aunt’s. I was even willing to put up with her oldest son, one of my cousins, who could be really obnoxious when he was a kid. A weekend with him was worth delicious stuff on sticks. Pig parts: ears, snouts, tongues, intestines — everything but the oink. Good stuff. It’s been such a long time and I don’t remember the details of what I saw. I do, however, remember that there were so many colors and aromas. I remember back then how my mind conjured up the old Thai saying describing the abundance of our land: ในน้ำมีปลา ในนามีข้าว nai naam mii plaa, nai naa mii khao, meaning “There are fish in the rivers; there is rice in the fields. Not that famine or starvation was ever an issue in our household, but I remember feeling comforted — just being surrounded by tangible proof of what the fertile Siamese land can bestow upon her inhabitants. Assorted sun-dried and prepared seafood and freshwater fish. Abundance of food choices aside, the place was cleaner and more organized than most wet markets in Bangkok. I had nothing against wet markets in general. But when you’re just a little kid, seeing live fish being smacked on the head with a steel mullet, gutted, and scaled can be pretty traumatic. And there was a lot of that going on at most wet markets. None of that happened at Or Tor Kor. Lod Chong (ลอดช่อง) – Pandan-flavored dessert, resembling long spätzle or Bánh Canh in appearance, served with jasmine-infused coconut milk, sweetened with palm sugar, topped with crushed ice. As an adult, I still yearn for this market. Sometimes, on a cold, snowy night in Chicago, I would close my eyes and visualize, in the manner of the Little Match Girl, myself walking up and down the aisles of Or Tor Kor market. I don’t know what it is about being surrounded by fresh tropical produce, but it seems to have an effect on me. Needless to say, I come to the market every time I visit Bangkok. I can skip a lot of places in the city, but Or Tor Kor is a must. that is more and more difficult to find these days. Fresh produce and prepared foods here are of very high quality. This also means they are not cheap. The prices are still very reasonable, however. 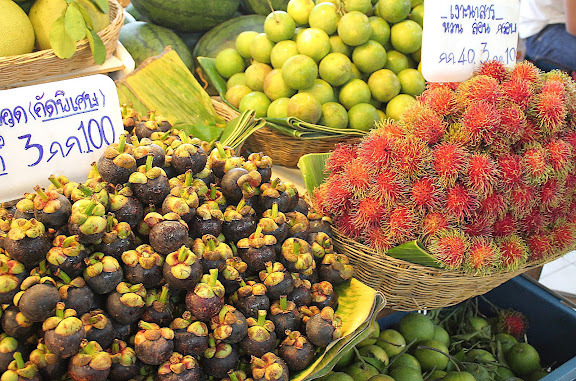 I’d rather pay more for a kilo of mangosteens each and every single one of which is sweet, fresh, and bug-free. Fortunately, getting to Or Tor Kor is very quick and easy these days regardless of where in Bangkok you’re coming from. The market is right on the subway route. In fact, if you get off at Kamphaeng Phet station (กำแพงเพชร), by taking the Or Tor Kor exit (marked the Marketing Organization for Farmers) you will walk right into the market. Bananas – you buy them green and let them ripen at home. There is an area where you sit down and enjoy the foods which you have purchased. What I usually do is bring a few people with me to the market. Then we turn into a bunch of hunter-gatherers who reconvene 15 minutes later at the dining area to enjoy the fruits of our collective labor. Once our stomachs are full, we walk around the market once more and buy everything in sight to take home to enjoy the rest of the week. Phu Lae pineapples from the north of Thailand – these are only the size of a small grapefruit. Or Tor Kor market is located in the same area as Jatujak (or Chatuchak) weekend market (ตลาดจตุจักร). So if you visit Jatujak, which you should, you might as well stop by Or Tor Kor. Assorted dried kitchen staples. Count Dracula has never been spotted here. The market is open daily from 6:00 am to 8:00 pm. From my observation, though foods and produce are available in abundance everyday, both the market and its offerings seem more lively on weekends. *Pronounced aw-taw-gaw. All three syllables exactly rhyme with “raw.” Completely disregard the presence of the letter “R” at the end of each syllable. 31 Responses to Or Tor Kor Market, Bangkok ตลาด อ.ต.ก. Wow, you’re are living it up. 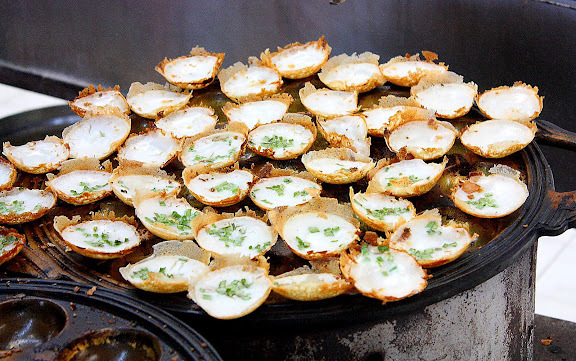 Is there anyway to bring khanom krok back to share with us? Nice!! Thanks for sharing with us. I love love these types of markets. The choices are varieties of items and ingredients is just to much. I love it. Oh what fun and I loved checking out the incredible selection you have i your farmers market. How are you ever going to make it on your return to Chicago? You are still coming back, aren’t you? I loved your insightful comment about food on sticks, even now, ‘m a sucker for anything skewered. This is one of the reasons I love Thailand, always. I was quite addicted to those puffed rice cakes when I was in Chiang Mai – delicious! How does the little pineapple differ in flavour to a regular large pineapple? Very interesting, love all the pictures, so much to learn…love the variety of fruits and food. THank you so much for sharing it! Khanom Krok!!! Yum. Brings back great memories of the khanom krok dude at my old market in Ta Wang Pa (in Jangwat Nan); he let me sprinkle the corn/green onion/taro on the coconut filling sometimes. Sigh. Those were the days. Will definitely post a link on my blog; take a peak at my past entries on Thai markets! (From here there are links to other related market-entries). leela thanks so much for showing us this market – I dont know if I will ever get to visit Bangkok so this is the next best thing! Thanks for a virtual tour of this fabulous market! Incredible! Mmm, grilled bananas are the best! The rice and coconut cakes sound lovely too. What an interesting market! Love local markets! 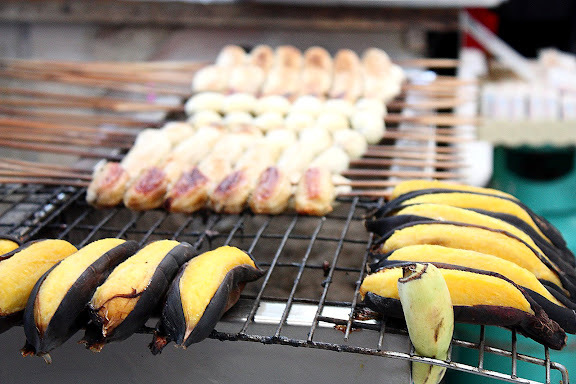 Im dying to try the grilled bananas, looks really good. Well, that looks like an amazing place! I would love to spend hours there poking around, trying new things! How fun! Great photos – the market looks amazing, what an assortment of beautiful products! What an incredible market! I can see why you miss it. The little cakes with the gooey tops look delicious! I am the local thai food lover. Thank you for sharing your good story…. you are making me take the next flight to go there! everything looks amazingly exotic and yummie! Oh man. I’m hungry again…. And I had just eaten! :o) Would kill for a big bowl of that lawd chong now! I went there last year, right after visiting Chatuchak. The market is truly amazing, and my biggest regret was that I didn’t have a kitchen available to me where I could do justice to the produce. Thanks for bringing back some sweet memories. Peter – No idea. There are two Royal Project stores located at both ends of the market. They sell cold weather produce, but I can’t remember whether it is organic. Regardless, no durians there. Lots of fresh fruits and vegetables, though. As far as durians, I’d say as long as you buy them in season, chances are they are tampered with. It’s the ones available off-season that are suspect. Ethephon is used in many other fruits, though — not just durians. They say the level of toxicity is too low to worry about. Then again, there haven’t been any published long-term studies, and you’re probably right in being apprehensive. You may want to contact Thai Organic Trade Association for information on where to find organic fruits. Anyone have any info for Peter? Peter – Correction: *they are NOT tampered with. look nice and clean , i will visit by next trip to Bangkok . I visited Or Tor Kor market last Sunday. Any Thai food lover should go their at least one time in his life. I came back to Bangkok for the last day only to go there and buy everything I could carry in my luggage: honey mangos (a bit expensive, the best mango I ate in my life. Gonna eat the last one with sticky rice), pineapple, ka prao, dry shrimps, cilantro roots… even shallots and garlic. I purchased as well a som tam mortal and pestel. I thought I would never pass the border in France, but I didn’t get any trouble. I highly recommend anyone visiting Or Tor Kor market to have lunch there. I had the best Som Tam ever. I didn’t find any Khanom Krok mentioned by Leela, so I will have to go back there for my next trip in Thailand. I hope by the end of the year. I am in love with this country and its amazing food.